Wouldn't it be cool if there was an app that could tell you what historical event occurred at any given location? Oh wait, there are such apps, which lock your location using GPS and pull data from Wikipedia. However, here is a newcomer to the App Store that is competent enough on the matter to need no external sources in order to do the same thing. 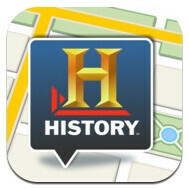 Introducing History here for iOS, brought to us by the History Channel. Available at the App Store, it contains over 3,500 points of interest throughout the United States, with new ones being added constantly, complemented by photos, videos and, of course, interesting facts related to the location's history. The list of locations includes museums, battlefields, monuments, famous homes, and a lot more. All in all, History here is an app that you should definitely get prior to setting off on your next road trip, or if you are simply fascinated by history. It is free to download from the App Store, so if you are interested, just follow the source link below. Woah, they didn't have an app for iOS yet??? That means that WINDOWS PHONE had a History Channel app before iOS! They're my new favorite channel!! !